Johnstone got into the Christmas spirit when at the weekend with a day-long party to mark the switch-on of the town’s festive lights. Huge crowds from the town and beyond turned out to see Houstoun Square lit up with a stunning festive display. During the afternoon, live entertainment and music from local acts on the main stage – hosted by Pulse FM – thrilled the crowds. Local singer and guitarist Matthew Gibb closed the show with a short set before the Christmas lights went on. Other musical acts on stage during the day included street dance crew Loonique, talented young singer Angel Gold and young musicians from Johnstone’s Splash Productions and Angela McCallum School of Music. And there was even a double dose of dancing from DSD Street Dance and the Gillian Whyte Dance School. 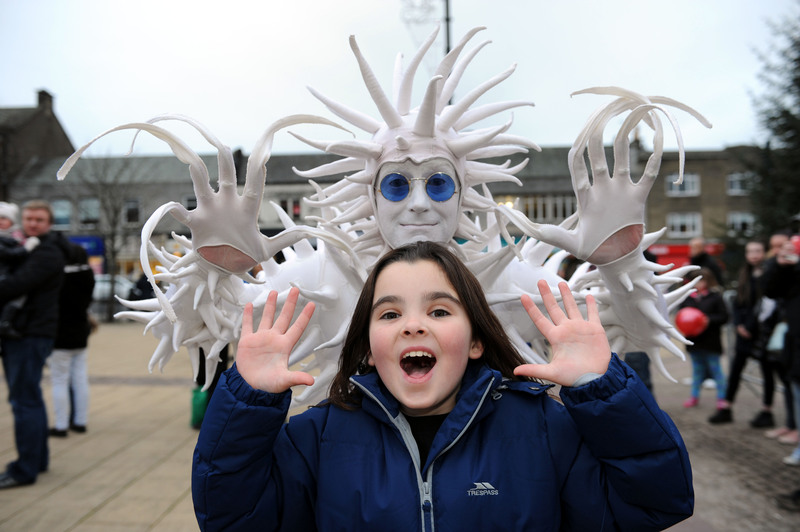 The square also hosted plenty to keep kids entertained, with funfair rides, and a special appearance of the Snow Queen and Jack Frost, as well as a marquee featuring hula hooping, balloon modelling and the ever-popular face painting. Santa’s grotto and Christmas story-telling was held inside Johnstone Town Hall along with retail therapy at the stalls and tea room hosted by St Vincent’s Hospice. Helping Renfrewshire’s Provost Anne Hall switch on the lights was competition winner Elsie Balfour, aged 11 from Wallace Primary School. Johnstone Christmas Lights Switch-on – run by Renfrewshire Council – is part of an exciting winter events programme for the area. Provost Hall said: “The Christmas lights switch-on in Johnstone is always a well-attended family event and it was a pleasure to be in the square once again. “It was an afternoon filled with family entertainment, both in the Square and inside Johnstone Town Hall.